Torla – This is placed within the turban and is like a fan. You would not see people wearing this in the street, as this is essentially an extra decoration to make the costume stand out. 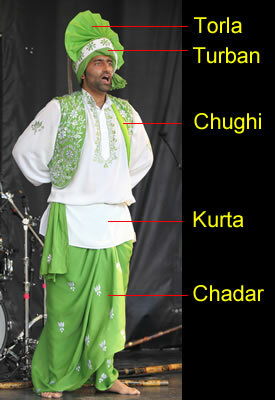 Turban – This is tied differently to the traditional turban which you can see Sikh’s wearing and is tied afresh before each show. Chughi – A waistcoat without buttons. Kurta – Similar to a silk buttoned shirt, very loose with embroidered patterns. Chadar – This is a loose loincloth tied around the dancers waist usually decorated.